[Toryboy, Winner of the Melbourne Cup 1865], H6705. Toryboy won the race 4 years after being unplaced in the first Cup. The Melbourne Cup is now the richest 3200 metre handicap race in the world. It went metric in 1972. The most memorable winning streak is the three consecutive cups won by Makybe Diva (2003-05). Other significant winners include Archer (1861-62), Carbine (1890), Phar Lap (1930), Rain Lover (1968-69) and Might and Power (1997). 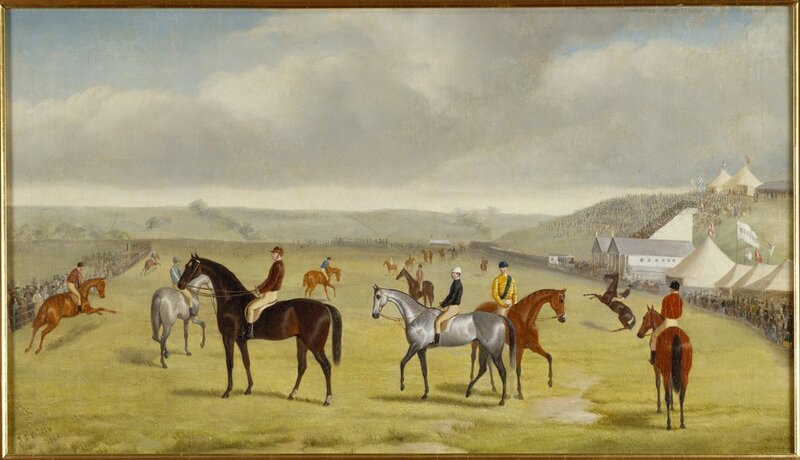 For years it was said that the horse Archer walked overland from Nowra (south coast of New South Wales) to compete in the 1861 Melbourne Cup. In fact he travelled on the steam ship City of Sydney. Archer’s trainer Etienne De Mestre decided to enter him for the 1863 cup, but due to a public holiday in Victoria (to celebrate the separation from New South Wales) his cabled entry did not reach the Victoria Turf Club office in time. Racing officials refused to compromise and accept his entry, with the result that all New South Wales trainers boycotted the race. In the end, only seven horses ran, all from Victoria (the smallest field in the history of the race). De Mestre was furious and vowed never to race in Melbourne again; however, he had a change of heart and won another two cups with Tim Whiffler (1867) and Calamia (1878). The winner of the 1863 race, Banker, has the distinction of carrying the lightest weight to victory (5 stone, 4 pounds / 34 kg). Carbine is the record holder for the highest weighted winner (10 stone, 5 pounds / 66 kg). Jockeys with multiple wins in the modern era include Harry White (4), Jim Johnson (3), Glen Boss (3) and Damien Oliver (2). In recent history Bart Cummings dominates the training ranks with 12 wins. His closest rival is Lee Freedman who has 5; the late George Hanlon had 3. For more information about the Cup, check out our Horse racing and the Melbourne Cup research guide. In the eighteen year person period between 1868 to 1886, only one Melbourne Cup “Trophy” was awarded, which was in 1876 when “Briseis” was the winner. The owner/trainer, James Wilson, had the Melbourne Stained Glass firm “Ferguson & Urie” create a stained glass window depicting Brisies which still exists to this day!